Class members are keeping busy. I was elected a Democratic precinct committeewoman and delegate to the Kansas state convention from Shawnee County. Gus Ranis, P’89, is a director of the Jewish Community Center of New Haven, Conn. Bernard Saklad is president of the men’s club at his synagogue in Delray Beach, Fla., after serving two years as president of the congregation. Marvin March, P’93, P’94, and his wife, Rita Sacks-March ’64, P’93, P’94, took a trip to China. And Tamar Soloff Brower has been a volunteer elementary-school classroom assistant, serves on the Temple Women board at Temple Bet Yahm, supports a Jewish community education program, and does promotional work for her husband, Martin, a writer and editor. Tamar and Martin urge classmates to visit them in Newport Beach, Calif. They plan to cruise down the West Coast to celebrate their 60th wedding anniversary. Max Perlitsh reports, “Efforts to fund the Class of 1952 Endowed Scholarship at $1 million have resulted in $920,000 in gifts and pledges. We hope to reach our goal before our next Reunion (in 2017). Our dear classmate Peter Kessner, P’75, P’80, G’15, passed away in March. Pete was deeply committed to the best interests of Brandeis and the Brandeis community. He was always proud of his membership in the first class and participated actively in Reunions and many alumni activities. Pete’s wife, Eve, has said that his memory would be honored by support for the Class of 1952 Endowed Scholarship.” See the In Memoriam section for more about Pete’s life. Phylis Levins Acker has started an online consignment business with her daughter Sherri and daughter-in-law Jane that sells gently worn high-end designer clothes, bags and shoes. The URL is www.couturereborn.com. Caroline Shaffer Westerhof is an adjunct professor teaching online. She also serves as a lector at a large congregation approximately four times a month and is on the board of the Pasco County (Fla.) Library Foundation. Joan Garfein Bot­winick forthrightly announces (in a perfectly composed email) that she is in the beginning stages of Alzheimer’s disease. Although she can no longer drive, she walks daily and still enjoys bike riding. She has good support since two of her three daughters live nearby. She writes, “My health is good, and I am far from dying unless I get hit by a car on my bicycle. If they take my bike away, I will spit!” We send Joan our best wishes, and our admiration for her honesty and sense of humor. Sumner Sheff writes that his son David has written a new book, “Clean: Overcoming Addiction and Ending America’s Greatest Tragedy.” David’s previous book, “Beautiful Boy: A Father’s Journey Through His Son’s Addiction,” was a New York Times best-seller. Joyce Posner Fishman, G’12, writes, “I missed out on campus life once Syd and I married in 1949 after his graduation from Harvard. I was then a commuter hitching rides with faculty members Osborne Earle and Merrill Peterson. By 1951, we were in our farmhouse in Marshfield, raising chickens (fun but folly) and our three sons (fun and more fun). Our sons, Steven, Gary and Paul, are all married, so we have three lovely in-law children and three grandchildren as well. Grandson Kyle, a Harvard graduate, works for the U.S. foreign service; Andrea ’12 graduated from Brandeis; and high-school sophomore Danny lives in San Francisco with his two dads and two moms — will he be Class of 2019 from Harvard or Brandeis? Syd and I have lived in Florida since we retired 25 years ago; Syd taught high-school chemistry and physical sciences, and I sold the World Book Encyclopedia. For the last two years of my career, I was the No. 1 salesperson in North America. We now reside at Newport Place, a senior residence in Boynton Beach. It has been a meaningful life of growth through a mix of delights and challenges, and now we are happy with things just as they are, which is pretty good. It is a pleasure to send fond regards to my classmates.” Sadly, many class members, their spouses or their significant others are suffering from conditions or diseases that limit their activities. Please know you are in our hearts and have our best wishes. We give thanks to all of you who are serving as caregivers; you and your efforts are greatly appreciated. 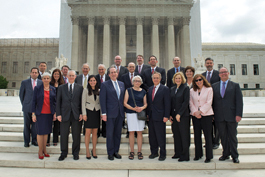 SUPREME STEP: Alumni lawyers from six decades were admitted to the bar of the U.S. Supreme Court during the university’s second annual group swearing-in ceremony in June. Front row, from left: Loretta Attardo ’70, Andrew Jagoda ’81, Monica Katz-Lapides ’06, President Frederick Lawrence, Klari Neuwelt ’68, Richard Wasserman ’69, Nancy Alpert ’75, Gwen Marcus ’78 and Daniel Kohn ’84. Back row: Jonathan Adelsberg ’89, Paul Sorrentino ’82, Melissa Greenberg Paszamant ’93, Jack Garfinkle ’93, Allan Drachman ’58, William Singer ’62, Jordan Keusch ’91, Alan Greenwald ’52, Michael Chartock ’86, Paul Ranis ’91, David Hendel ’79, Jane Kahn ’77 and Michael Bien ’77.